A tropical rainforest is a forest that is situated within the latitudes 28 degrees north or south of the equator. The location roughly falls in Asian countries, Australia, Africa, South and Central America, Mexico and on islands in the Pacific, Caribbean, and Indian Ocean. Tropical rain forests have higher than average temperatures (18°C or 64°F) and as the name suggests, high amounts of rainfall. Average rainfall is around 175 cm (69 in) and 200 cm (79 in) but can exceed up to 1,000 cm (390 in). 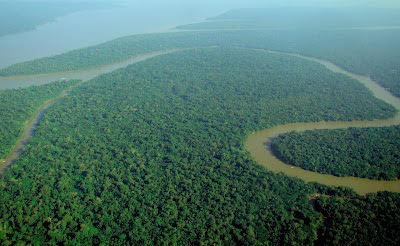 50% of all living animals and plants reside in rainforests. More than 60% of flowering plants can be found within them. Rainforests contain so much life in it that a hectare of it may contain 2,000 different species of insect, up to 807 trees of 313 species and 1,500 species of higher plants. Tropical rainforests also have a significant impact in the world of medicine since more than 25% of natural medicine comes from them. It is possible that undiscovered cures for diseases are still waiting to be found in rainforests. Because of the continued increase of human population and activity, these ecosystems are threatened. Aside from factors such as climate change and natural disasters, human destruction of these forests for logging and agricultural purposes are taking its toll. Areas covered by rainforests are rapidly shrinking because of it. Deforestation can have a significant effect on tropical rainfall, new research confirms. The findings have potentially devastating impacts for people living in and near the Amazon and Congo forests. A team from the University of Leeds and the NERC Centre for Ecology & Hydrology found that for the majority of the Earth's tropical land surface, air passing over extensive forests produces at least twice as much rain as air passing over little vegetation. In some cases these forests increased rainfall thousands of kilometres away. By combining observational data with predictions of future deforestation, the researchers estimate that destruction of tropical forests would reduce rain across the Amazon basin by up to a fifth (21 per cent) in the dry season by 2050. The study is published today in Nature. Lead author Dr Dominick Spracklen from the School of Earth and Environment at the University of Leeds said: "We were surprised to find that this effect occurs strongly across more than half of the tropics. We found that the Amazon and Congo forests maintain rainfall over the periphery of the forest basins - regions where large numbers of people live and rely on rainfall for their livelihoods. Scientists have debated whether vegetation increases rainfall for hundreds of years. It is well established that plants put moisture back in the air through their leaves by a process known as evapotranspiration, but the quantity and geographical reach of rainfall generated by large forests has – until now – been unclear. While there is plenty of anecdotal evidence that forests significantly increase rainfall, until now there has been a lack of observational evidence. The team used newly available NASA satellite observations of rainfall and vegetation, along with a model which predicts atmospheric wind flow patterns, to explore the impact of the Earth's tropical forests. "We looked at what had been happening to the air over previous days – where it came from and how much forest it had travelled over," Dr Spracklen said. To understand the relationship in detail, they investigated the journey of air masses arriving over different parts of the forest, to see the cumulative amount of leaf cover the air had moved over during the previous ten days, not just the amount of vegetation it was over when it rained. This showed that the more vegetation the air had travelled over, the more moisture it carried and more rain was produced. Dr Stephen Arnold from the University of Leeds, a co-author on the paper, said: "The observations show that to understand how forests impact rainfall, we need to account for how air has interacted with vegetation during its journey through the atmosphere often over thousands of kilometres. This has significant implications for how policy makers should consider the environmental impacts of deforestation, since its effects on rainfall patterns may be felt not only locally, but on a continental scale." Dr Spracklen said the findings showed the importance of initiatives to protect tropical forests. "Brazil has recently made progress in slowing the historically high rates of deforestation across the Amazon and our study emphasises that this progress must be maintained if impacts on rainfall are to be avoided. "The Amazon forest maintains rainfall over important agricultural regions of Southern Brazil, while preserving the forests of the Congo Basin increases rainfall in regions of Southern Africa where rainfed agriculture is important. Increased drought in these regions would have severe implications for their mostly subsistence farmers."